These pickles are addictive, gorgeous and ridiculously easy to put together in minutes. Use whatever spices you already have on hand, a vinegar with 5% acidity and, in addition to cucumbers and red onion, any raw fresh vegetables you want. I added in the tips of some flowering chives I bought in Chinatown a week ago—besides looking lovely in the brine, they also tasted amazing and provided a contrasting spicy bite that complimented the other pickled components perfectly. Pack the cucumber, onion, garlic, dill and chives nicely into 2-3 Ball jars. Combine the rest of the ingredients together in a small saucepan and bring to a boil. Boil for one minute, uncovered. 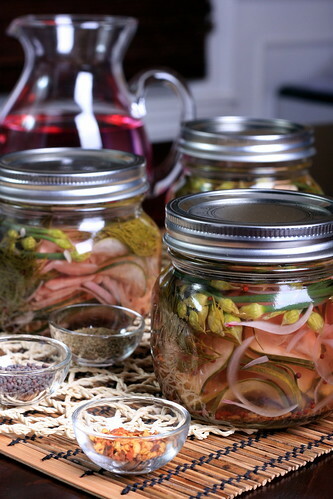 Pour the hot vinegar mixture into each of the jars and place the lid on immediately, then place in the refrigerator to marinate for 1-2 days without opening the lids. Use within two weeks.